Johns Hopkins amassed millions by trying almost anything that promised to make money--investing in liquor, real estate, coal-mining, fertilizer, and more. He never married, and it was only after he’d retired from most of those businesses that the public saw what he intended to do with his fortune: create a university--including a medical school--and a hospital. 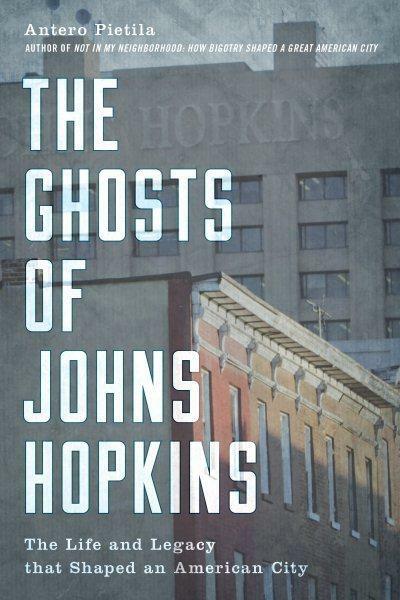 Author Antero Pietila guides us through his book, “The Ghosts of Johns Hopkins" to show us the man behind the name. Pietila will be speaking on Sunday Mar. 24 at 2pm at the Engineers Club in Mt. Vernon, more info at this link. The non-profit Civil Justice believes every citizen deserves his or her day in court. That’s why they line up legal counsel to represent people with low or moderate incomes in non-criminal cases. Executive director Eden Forsythe talks about why there is a direct connection between fair representation in court and restoring faith in democracy and civic engagement. Plus, we meet Civil Justice lawyer Chelsea Ortega and her client, Renee Spencer to hear about their experience. For more information about the organization, visit the Civil Justice website here. ‘Knowledge is Power’ is a familiar adage. In our digital age, perhaps a more relevant aphorism and one exemplified by our guests today is ‘Knowledge is Access.’ Case in point: access to the syllabus for ‘Black Womanhood,’ a graduate course at Johns Hopkins University, has been made available online ... and has spread like wildfire. The course is co-taught by Professor Martha S. Jones, the Society of Black Alumni Presidential Professor, and Professor of History, at Johns Hopkins University Krieger School of Arts and Sciences and Professor Jessica Marie Johnson, Assistant Professor in the Center for Africana Studies and Department of History at Hopkins. They discuss why access to knowledge can be so powerful and how online engagement affects curriculum. You can access the Black Womanhood course syllabus here.